This one is for me! I'm like the cleaning lady who doesn't clean her own house. I'm the design and renovation chick that doesn't do a dang thing to her own house until now. I have just one house right now, with not much renovation needed. So, I finally have time to work on my own house. Condo, that is. Can you believe I've only painted one room in the place since it was built 7 years ago. The white walls were comforting for a while, I've got to be honest. With all of the neutral colors I was putting in the other houses, I kinda learned to appreciate the blank canvas. I also just couldn't commit to anything. One month I wanted this, the next that. What to do? Finally, this year I decided to put a design board together so I could get it together once and for all. Ok this is embarrassing. Don't judge. Yes, that's a baby gate in the fireplace. We can finally take it out with only a slim possibility that my 2 year old will dive in headfirst to play with the rocks. Yes, that's a monitor on top which we plug our laptops in to play shows and movies. Look, we've been traveling ok? We sold everything we owned a few years ago and just never committed to putting a home back together. Get off my back. I'm working on making this place more legit! Anyhow, we're keeping the rug bc it hides lots of little kid droppings like broken crayons, trail mix, you name it. It's like the cave of lost things. A keeper. The couch can go. It's lame. Maybe we'll even get a real TV. Sofa: We need something that is more modern can fit in the small room and is comfortable. A couch should be, no? Otherwise, what's the point? Chair: The Eames lounge chair is a dream. I want it and have wanted it for a while. I'm a sucker for vintage, mid-century modern. Preferably the chair I find is the real deal, in good condition and the leather is nice and warn in for me. Plants: This place is filled with hard spaces. The ceiling, pillars and floors are all concrete and the entire east wall is steel and glass. We need a little nature up in here. Charcoal Gray Accent Walls: I love that most of the condo has white walls. It's bright, airy and different than any of the homes I renovate. I do think it needs a little bit of color, though. I know gray is probably not a color. Oh well. It's happening. I'm going to paint the walls behind the sofa and fireplace Behr Evening Hush. I may also take it to the fireplace wall, too. Barn Wood Accent Wall: This may or may not happen. I'm up in the air about wood accent walls at this point. I love them, but they are EVERYWHERE. I think it might warm up the space a little but am hesitant about spending the money. If I do go forward with it, it will be installed on the fireplace wall which extends to the second floor and into the loft bedroom. Accents: The rest of the items are a throw blanket and some plants. The room needs some life and warmth so these will just round out the edges. And who wouldn't want to pick some fruit straight off their own potted tree? Duh. That's it for now. It's a small room with a lot going on structurally and height wise so I don't want to clutter it with too much else. I'll update you as I update the room. First, paint. Woo! Want your own design? Click that box, yo. Jessie Deye, otherwise known as @gymgirljessie, and I have been talking about her space for several months now. Back and forth we’ve chatted about what should she do about the floors, what about the ceiling, the counter, etc. I finally put together a design for her which ended up being what I would call a Modern Schoolhouse Kitchen. I took the aspects she had already decided on, like white cabinets and dark floors, and added the rest of the pieces to finish the look. Like many homeowners, she was getting overwhelmed by the multitude of decisions she had to make and trying to get it all in under budget. Mood boards are really helpful because you can see the whole room all at once rather than just imagining how it will all fit together. Even more difficult, in her situation, is trying to make decisions for a room that is changing by the week! Jessie’s kitchen was once a dining room. Two walls came down opening it up to the living room and eliminating a hallway. The living room was once lofted to the bedroom above but will now receive a new ceiling closing it in. The ceiling in what will be the new kitchen was torn out to expose the 100+ year old beams. Soon she’ll have new beams next to old beams, which was also a source of mental anguish. Don’t worry, there is a solution. Ceiling: The most difficult piece of the puzzle! Jessie and I went back and forth on this one. Paint the whole thing or don’t paint it? "Ruin" the 100 year old wood or not? Let the living room and kitchen ceilings live side by side in awkwardness of new boards and old boards? No. There was no solution. Until there was! Finally, after lots of searching, I found the answer. Paint some of it. Dun Dun DUN!!!! Seriously, though. Instead of doing it all or nothing, why not make it a statement…ON THE CEILING? Paint most of the ceiling so it ties the two rooms together, but leave a strip above the island unfinished. Imagine how your eye will be pulled up to this fabulous unfinished section of beams of the room. Now this section and the old as crap wood will be highlighted. IT WILL ROCK. Flooring: In order to save some cash, the pine floors will be refinished. A dark stain will help the floor fade away to showcase the exposed brick walls and fabulous ceiling. Sometimes dark floors are poo poo-ed for their ability to highlight dirt. But, since Jessie’s unit is at the top of the building, it’s likely most of any dirt that would be tracked in would be gone by the time anyone gets to her door. Cabinets: Shaker cabinets are easy to find these days and will be around for a long time making them a good choice. There will be a large island with seating which will hold the dishwasher and a microwave on the end. The cabinetry will also run the length of the back wall. Instead of upper cabinets, shelving will flank either side of the range hood. Shelving: This is an opportunity to get some rustic barn wood into the design to balance out the newness of the rest of the kitchen. The gas pipe shelving has been a favorite of hers in the past, although she could opt for black iron brackets as well. Counters: Ideally, white marble counters would be awesome with this design, but maintenance is a concern. A good alternative is a whiter granite counter such as River White granite. 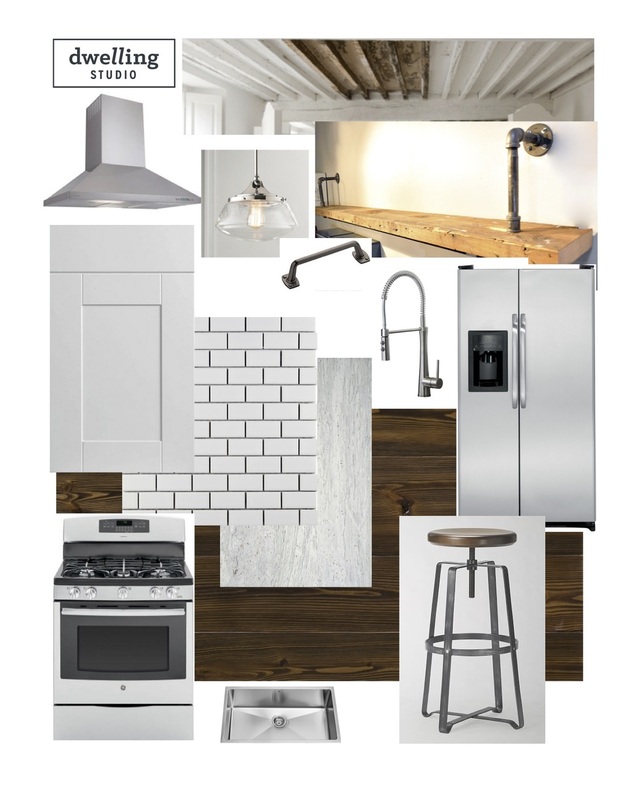 Backsplash: To keep things in budget, simple and with the schoolhouse theme, I opted for white subway tile. A good go-to. To spruce it up a bit, a darker gray grout would be a good option. It could run to the ceiling, but since the ceilings are 11 feet tall, I’d suggest running it to just below the first shelf. Furnishings: These stools are interesting with the bendy metal bases but have the fun spinn-y tops. Gotta give Jessie somewhere to spin. Fixtures and Hardware: The lighting has to be simple in a schoolhouse design. A couple of simple shape-y glass pendant lights will bring a little sparkle to the room without being bulky and intrusive. The faucet has a powerful, utilitarian look. The cabinet pulls are clean lined, pewter schoolhouse pulls that finish off the look. So, that’s it. I can’t wait to see the final room which should be finishing up sometime this winter. Let's hope for some after pics!